Highlights from Rob Zombie’s two performances at his Great American Nightmare Halloween attraction will be heard Halloween night–Friday, October 31–from 9:00-10:00 PM Eastern Time on Howard Stern’s SiriusXM channel Howard 101. The concerts were recorded at the September 19 opening night for Rob Zombie’s Great American Nightmare in Scottsdale, Arizona and the September 26 GAN opening night in Villa Park, Illinois. Both Great American Nightmare locations will be open October 30 and 31, and November 1 for those that would like to experience the ultimate Halloween horror event firsthand. Great American Nightmare features attractions based on Zombie’s own horror films. At WestWorld Of Scottsdale in Scottsdale, AZ, patrons take a sensory-deprived journey through The Lords Of Salem In Total Black Out before witnessing the debut of Captain Spaulding’s Clown School In 3D andThe Devil’s Rejects. The Odeum Expo in Villa Park, IL, near Chicago features The Lords Of Salem In Total Black Out, The Haunted World Of El Superbeasto 3D, and Haunt Of 1,000 Corpses – first seen at the inaugural Great American Nightmare in Pomona, CA in 2013. The fully immersive haunted house experience at both Rob Zombie’s Great American Nightmarelocations include the Bloody Boulevard with freak shows, musical entertainment–including Street Drum Corps’ renowned Blood Drums (Scottsdale) and Prime Evil Percussion (Villa Park)–roaming characters, themed food and beverages, games and vendors each night. 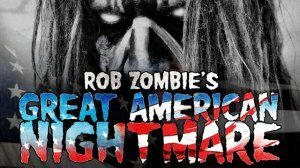 Tickets for Rob Zombie’s Great American Nightmare are on sale now at www.GreatAmericanNightmare.com, with prices starting at $25. A limited number of VIP packages are also available for purchase atwww.GreatAmericanNightmare.com. All VIP packages include a commemorative t-shirt and quicker access to the haunted attractions than general admission. This entry was posted in Haunted Attractions, Home Page, Home Page Slider, News and tagged Andy Gould, Odeum Expo, Rob Zombie’s Great American Nightmare, Steve Kopelman, WestWorld Of Scottsdale. Bookmark the permalink.